Never had a problem with Amazon.de not delivering to Switzerland. There are shops a lots which they don't delivery to Swizerland in Europa. Your domestic suggestions are fine, but I don't see a reason to give up on foreign online shops. As I said, for example, I doubt you'll be able to find an online bookstore offering better deals than Amazon.de. Not only are the German prices lower, you also get a VAT refund automatically! So it's always worth comparing domestic and foreign offers! Did you buy from Amazon or a third-party seller? Only problem I can see with that idea is everything's in German - including the books! They used to have a English book section, but doesn't seem to exist now. Which leaves you with Amazon.co.uk or better yet BookDepository who have free shipping with no minimum order price requirement. All sets were sold by Amazon EU S.a.r.l. Niederlassung Deutschland. Only one could not be shipped to Switzerland. - so you either have to cut off the plug and replace with a Swiss one or add an adapter, costing in the region of 8 or 9 chufs. Adapter plugs regularly appear on Ricardo and eBay for in the region of 2 CHF. If you're not to concerned about them being pre-owned, buy a job load and save on postage. Last time I bought a bag of 10 and payed 19 CHF including postage. Where? I used to see an tab saying English books, but not anymore. 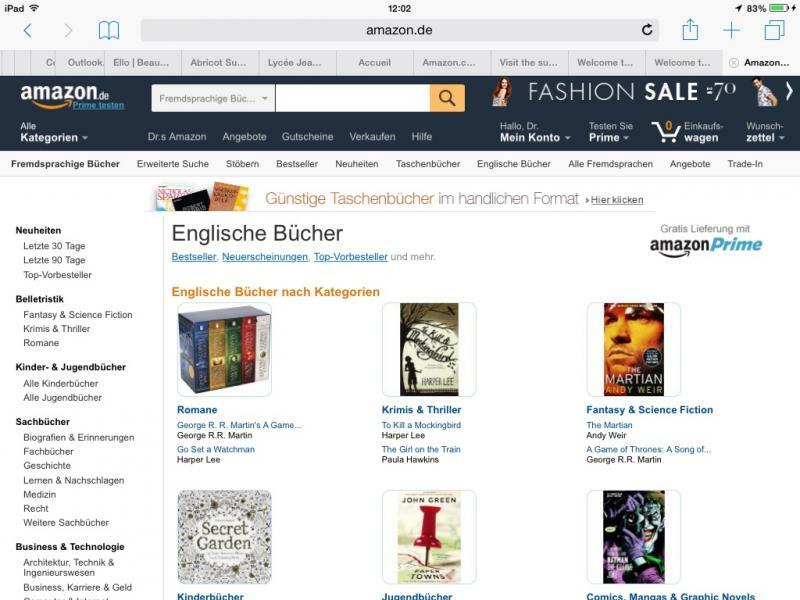 You have to click on the 'fremdsprachliche Bücher' tab and from there you click on englische Bücher and voilà loads of English books to choose from. As far as Amazon vs Book depository is concerned I always weigh up the pros and cons as often the books are more expensive on book depository than on Amazon which negates the saving obtained from free shipping. Last edited by Belgianmum; 23.07.2015 at 12:59. Thanks Belgianmum. Of course if you don't know what 'fremdsprachliche Bücher' means it ain't that much help. Whats going on with amazon.de these days, I'm getting much more "this item wont deliver to Switzerland" including things that i was able to order a year ago. Sometimes it helps to switch to a different Amazon locale (in Europe) to find the same item from a different vendor (i.e. Amazon _proper_, not a marketplace vendor) available for shipping to Switzerland. Speaking of Amazon, there's something I discovered which might be useful for EF members who do order from Amazon in Switzerland. 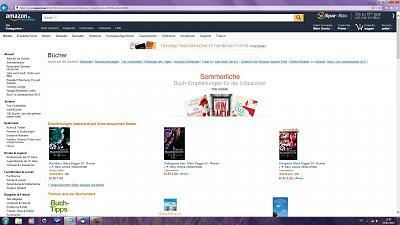 The German Amazon.de on-line store is now available in English. Now for some reason this option seems to be only available on my desktop---whenever I see the web site on my tablet, I only see the German version. But there is an "In English/Auf Deutsch" button available at the top of the menu. P.S. I do work for an Amazon facility in Baltimore. But I learned about this on-line, NOT from work. 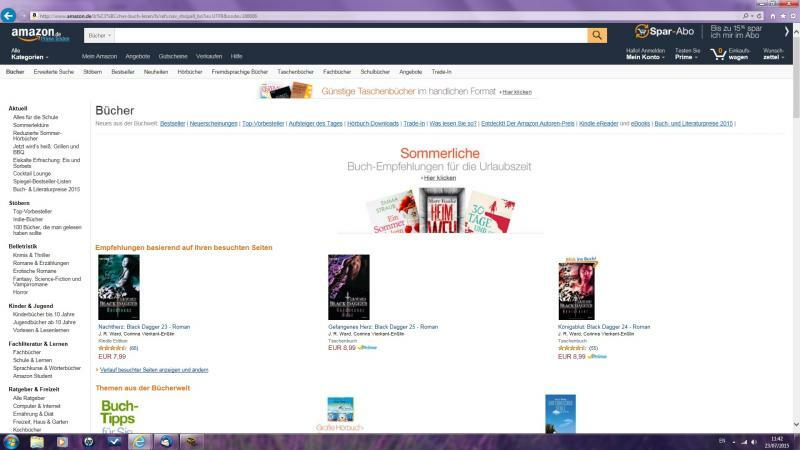 Seems to be a beta version so hopefully Amazon.de will continue to use it. Stupid question, but is there a comparative advantage to be using Amazon.de instead of Amazon.fr for deliveries in Switzerland? So far I've only been using the .fr site, they deliver books in English as well as French, above a certain amount the delivery is free and I find them quite efficient with regards to delivery times. I can also get english or French books delivered on my Kindle. But I only ever order books and the odd DVD, haven't tried ordering the other items they sell. No real advantage to either as far as I can see. Sometimes they will deliver stuff to Switzerland via .fr site that they won't on the .de site and vice versa. I tend to flip between fr, de and co.uk when I'm looking for something and work out which is the best deal. The French site is obviously better if you're looking for stuff in French. I always take a look on toppreis.ch and have bought some things on microspot.ch (they have good prices) and interdiscount. is there a comparative advantage to be using Amazon.de instead of Amazon.fr for deliveries in Switzerland? If Amazon in the EU is an option for you, have https://keepa.com/ installed as a browser plugin. This plugin will give you a price comparison across all Amazon sites (of which there are 3+2 of immediate interest to Switzerland) and will be quite instructional in showing you price differences of up to 40% for the exact same product at the exact same time in different Amazon EU locales. Oh, and regardless of the locale - Amazon ships from whatever warehouse the product lives in. Just watch the parcel tracking. Hi everyone, I'm looking for somewhere I can go to get legal advice. Free or cheap most preferably..... Please help.